The 1980s also saw other technological developments, especially in the field of genetics and reproduction. 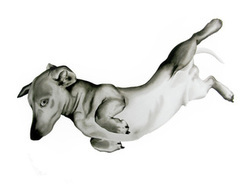 In her work, Ness Flett uses the domesticated animal to examine ideas of breeding, natural selection and ethics. Here, the Daschund can be seen as an example of the desire of humans to control a species and manipulate genetic traits through evolving technology.